After reading your sermon I thought you might enjoy these photos and story. This year we had a coyote den along the edge of our field under an upturned aspen. It seems only one pup survived, and they stayed around our field as it is full of ground squirrels. 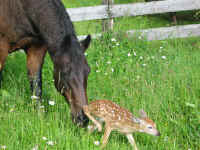 In June, a doe gave birth to her fawn in our barnyard. The two coyotes, mother and son, zeroed in on the fawn. 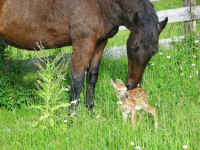 The doe put up a horrendous fight to protect her fawn by driving off the coyotes, but she was losing the battle because one coyote would divert her attention while the other would circle back to the barnyard. I learned something about myself from this experience. As much as I had enjoyed watching the coyotes all spring, and as much as I thought I "believed" in nature as it is, I was not going to let those coyotes take the fawn. The mystery of predation is the hardest concept for me to get my mind around. J. B. McDaniel wrote somewhere that "God is on the side of the fox and on the side of the rabbit. Should the rabbit escape the fox, God shares in the rabbit's joy and the fox's hunger. By virtue of infinite tenderness, there is suffering even in God." That helps a little.